Last year I did some brass work on The Bad Dogs’ self-titled debut EP. This interesting R&B/ pop group consists of the very young French singers Mathilda Buzaré and Marie Niquet, who occasionally perform covers as well as original songs with Marie’s father Jean-Christophe. 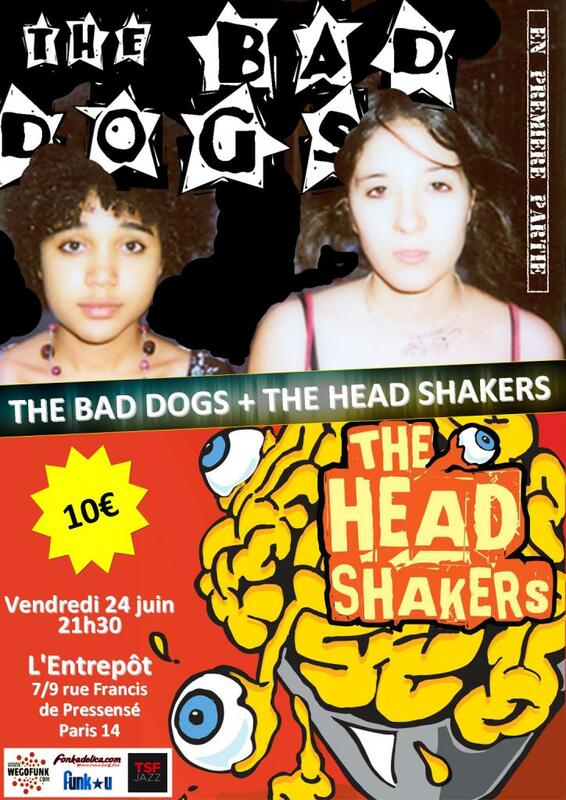 That will be the case this Friday night when they open for the très très rock’n’soul Head Shakers at L’Entrepôt (i.e. “The Warehouse”) located at 7 rue Francis de Pressensé, 75014 in lovely Paris. Cool poster, no? The goal for the album was to create a nu-funk retro sound, and recreate the original brass vibe of the 60s, using ribbon microphones microphone placement and playing style – (a little less clean but more’funky) . The horn section consisted of 1 or 2 trumpets, trombone, alto/tenor and bari saxophones. The arrangements range from replaying original licks on some of the song to actually writing fully new arrangements. LISTEN TO THE ALBUM HERE: and if you like it – help out young artists by buying their music!